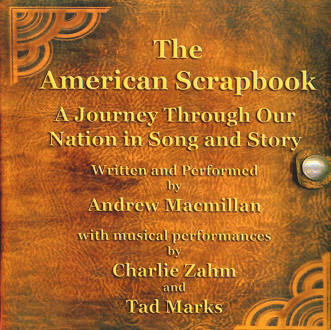 A journey through the years in song and story---from George Washington to John F. Kennedy, through the words of Robert Frost, Carl Sandburg, Ralph Waldo Emerson and Walt Whitman; the music of Stephen Foster, George M. Cohan and others, The American Scrapbook celebrates the spirit that is America, past and present! An excellent program written, assembled and recited by Andrew Macmillan, celebrated actor and narrator. Music performed by Charlie Zahm and Tad Marks. A 60-minute journey so enjoyable I promise you will be lost in the moments of our history!